Maybe I misunderstood you then, sarcasm doesn't translate well over the net. Yupp, sarcasm doesn't do well written! I have a couple of solid tops so I'm content! But, it's like.......hmmm.....drugs? Very addictive, so I keep on looking. Good looking rosewood! I like when the fretboard is dark like on a real LP (52-60 original vintage). Looks so much better with MOP!! I just bought this 59R (will be for sale soon if its veneer). like many others, you are an veneer snob/opinionated fool, stop trashing other peoples purchases, there is nothing wrong with veneer. Sure, there's nothing wrong with veneer, but why should anybody have to put up with it when solid wood is available? What I'm saying is, why the f*ck do makers use it? 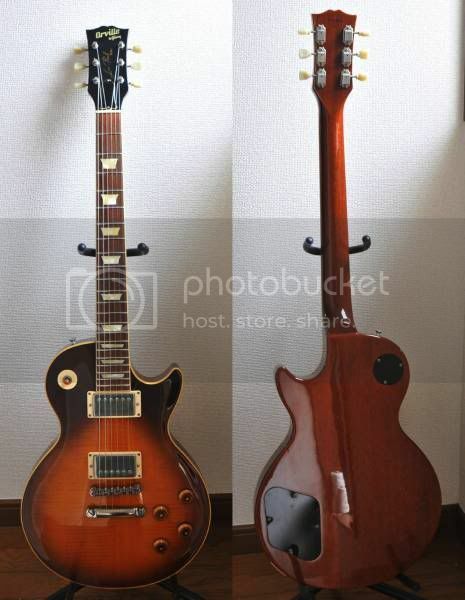 In the case of the Japanese guitars I think the makers use veneer because it is more work, and more craftsmanship involved to use it, so maybe in Japan it shows higher craftsmanship being used on the guitar? People who are happy to have plain solid tops (myself included) will always see a veneer top as a second rate top, and that flamey veneer is essentially pointless on a guitar, sorry, just my opinion. I can't see the super duper skills required to attach a veneer onto another piece of wood. Sure its curved but its just to use vacuum press. For me, a veneer kills the mojo. Despite there might be no tonal difference and that there is no visual difference. Why the Japanese did it? Easy: Its far more cheaper than solid flame maple. Over here, a piece of American maple with flames cost several hundred ? and so it does in Japan too. They just need to make a hybrid of maple that grows fast and is subjected to continuous trauma thus creating Birdseye, flame, curly, etc figured maple. There is no tonal difference between a solid and veneer and currently I do not own a veneer topped guitar but I have no issues with them. They still look good and you do not pull your pickups while jamming or playing live to show people your solid top so who cares really? It's not a guitar without maple cap,it has mahogany body,maple cap and a thin veneer on top.If I would compare 2 guitars with and without veneer on top I would always buy the one with the better tone. I owned my LS120 for 2 years before I realised it had a veneer top, before that I thought it was the best LP I had, after I thought exactly the same. I've seen a few de-laminated Greco 850's, but never a 1200, a Tokai or an OBG, don't think it makes one jot of difference to tone or 'mojo', the only difference is cost. I'm a bit of a veneer snob myself but that's partly because I'm mostly into plain tops. But veneer or no veneer, that is a smokin' looking LP. Is yours drilled for pickguard? You mind take a good pic of the fretboard? The rw on yours looks better than anything I have seen on an ObG before.